Tyler Ugolyn is a name that the sports anchors at ESPN, Fox, NBC or CBS didn’t call out during his college playing years. For even though he was a McDonalds All American nominated High School player at Ridgefield (Conn.) High School, and rated one of the Top 250 high school players in the nation, his basketball career at Columbia, hampered by injuries, did not include any game-winning shots, ninety-two foot buzzer beaters or highlight video moves. However, the impact that Tyler Ugolyn had on people as a student-athlete at Columbia goes much further than statistics. In fact, you’d be hard pressed to find a human being who contributed more to the betterment of people’s lives than Tyler Ugolyn. For even when his tendonitis curtailed his playing career at Columbia, Tyler started a Sunday morning basketball clinic for Harlem area youngsters. He still found time, as a devout Catholic, to attend weekly masses and help found Columbia Catholic Athletes. The Tyler Ugolyn Champions of Character Program, held annually in Levien Gym with the assistance of younger brother Trevor, is another testament to his desire to help youngsters improve their people and basketball skills. Do you sometimes wonder if the world is fair? Tyler graduates from Columbia and, just months later, begin working at Fred Alger Management on the 93rd floor of World Trade Center 1. He’s at work as a research associate on that fateful day, September 11, 2001. So how should we remember this gem of a young man, who was able to balance the academic demands of an Ivy League education, the desire to compete in Division I basketball, the social demands of a bright, handsome, best friend-to-many guy and yet one who still finds time to devote energy and compassion to those not as fortunate as him? His love for playing the game of basketball is beyond reproach. A playground court in his hometown has been named in his honor. His basketball jersey hangs in his high school gym next to the American flag. 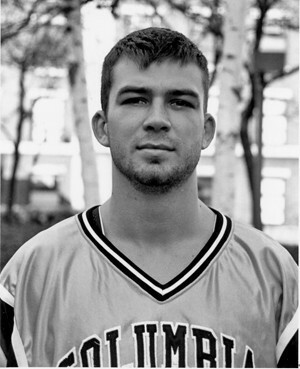 A plaque in the Basketball Hall of Fame reads, “I Just Love Playing The Game, in memory of Tyler Ugolyn, Columbia University, Class of 2001, #34”. But for family, friends, teammates, those kids who attended the clinics, they won’t remember Tyler Ugolyn, that basketball player from Columbia. They’ll remember a smile, a hug, a pass, a handshake, a look in the eye that they’ll never forget. A high school teacher of Ty's recently wrote to Victor and Diane. Among the nice things she said was that she would never forget a conversation with Ty where she had asked him, while a student there, why so many boys were not going out for the basketball team. Ty told her that a lot of them didn't like the coach. She then said, "Well, what about you?" To which Ty replied: "It doesn't matter to me. I just love playing the game."